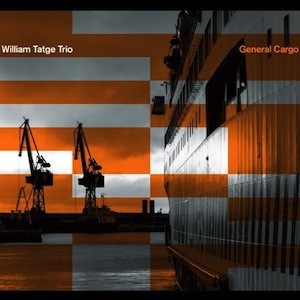 Personnel - William Tatge: piano; Pablo Menares: bass; Nick Anderson: drums. The Italian-born William Tatge, son of American parents, moved to New York in 2008, where he found his own musical voice. By listening to his new work, General Cargo, inspired by cultural and historical experiences, one may conclude he applies some of the lyricism from his former teachers - Stefano Bollani and Enrico Pieranunzi - as a reference but expands them into new musical horizons, concurrently probing and intimate. Summoning his NY-based trio mates, bassist Pablo Menares and drummer Nick Anderson, Tatge interprets seven original compositions whose durations range from seven to nine minutes, approximately. Obeying strict structural forms, the trio navigates the written material with ease, often creating ambiguous narratives and taking side routes in their improvisations to assure the music is never conservative but rather surprising. Displaying an innate rhythmic feel, “Illegal Machines” emphasizes a sublime work by the pianist in a successful combination of hefty phrases on the medium register with resonant bass movements on the lower octaves. Menares lays down a funk-inflected groove that doesn’t sound too conventional while Anderson keeps everything under control with a poise, syncopated pulse, frequently spiked up by intelligent fills. More about the drummer's technique is saved for a last-minute vamp especially designed for that purpose. The pavement becomes velvetier on “The Lay of the Land” to serve the pianist’s pensive rumination forged with unobvious melodies. Bassist and drummer provide minimalistic support, contributing understated lines and low-key brushwork, respectively. The soothing waves persist on “Hidden Agenda”, even when the tension is confined in-between lines and the trio takes a slightly more grooving orientation. Tatge’s anti-cliché methodology airs a fluidity of language that comes with narrative coherence. Deliberately changing mood and pace along the way, the trio also unveils a Corea-like swinging motion on “Civilization”, a piece that, by the end, flourishes an intense harmonic turnaround, restless bass impulses, and percolating interlocking drums. They switch things up for “Have You Seen Robert Boston?”, a searching exercise that becomes inflated with staggeringly compact rhythmic punches. However, besides rocking with glee, you’ll find transitory moments of contemplation, breeziness, and volatility. While the constant energy fluctuations are part of their progressive post-bop ethos, the angular lines and fractured phrasing embrace metaphor and avoid expected scenarios. Regardless a few moments of ruminative impasse, the trio provides us with a mature outing filled with enough emotion and intensity to keep you wide-awake. 01 - Illegal Machines ► 04 - Civilization ► 06 – Have You Seen Robert Boston?